Having the chance to visit Deadvlei and Sossusvlei and photographing it counts to the greatest moments of my travel life. And the most surreal ones. Not without a good reason is Deadvlei sometimes referred to as the 8th world wonder or a place to see before you die. 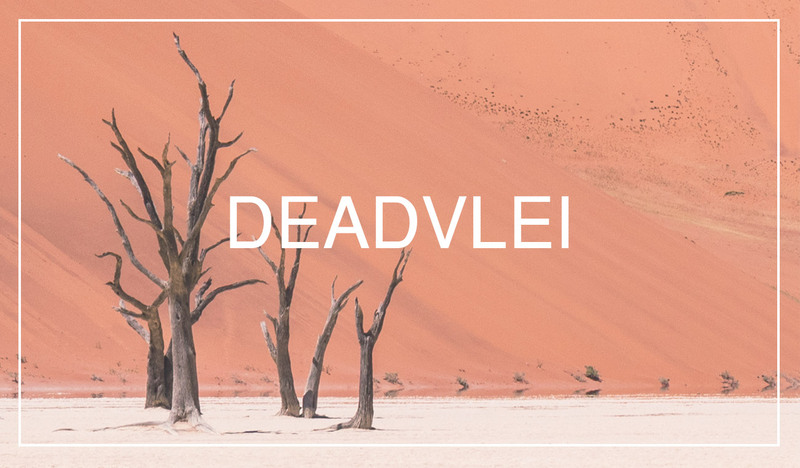 You may be wondering – what is Deadvlei and why is it so cool? Deadvlei is a clay pan near the settlement of Sesriem, in central Namibia. The pan itself is located at the end of the Tsauchab river which sort of disappears in the sand dunes in its fruitless attempt to reach the Atlantic ocean. It was formed after rainfall, when the river flooded, creating temporary shallow pools (‘vlei’ = marsh). These pools allowed low vegetation and camel thorn trees thorn. The latter is what’s so intriguing today. Trees in Deadvlei died 600-700 years ago. All that remains is their almost black skeletons standing around like an ancient formation of well-tanned cheerleaders. When the climate changed, drought hit the area and the water supply was blocked. The camel thorn trees died (estimated 600-700 years ago!). What remains is their almost black skeletons standing around like an ancient formation of well-tanned cheerleaders. The climate is so dry, that they cannot decompose. Now that’s seriously fascinating by itself. But what really adds the cherry on a cake is the setting – a white pan full of dead trees surrounded by massive orange dunes going up to the electric blue sky. In fact, these are the highest sand dunes in the world. Just wow! 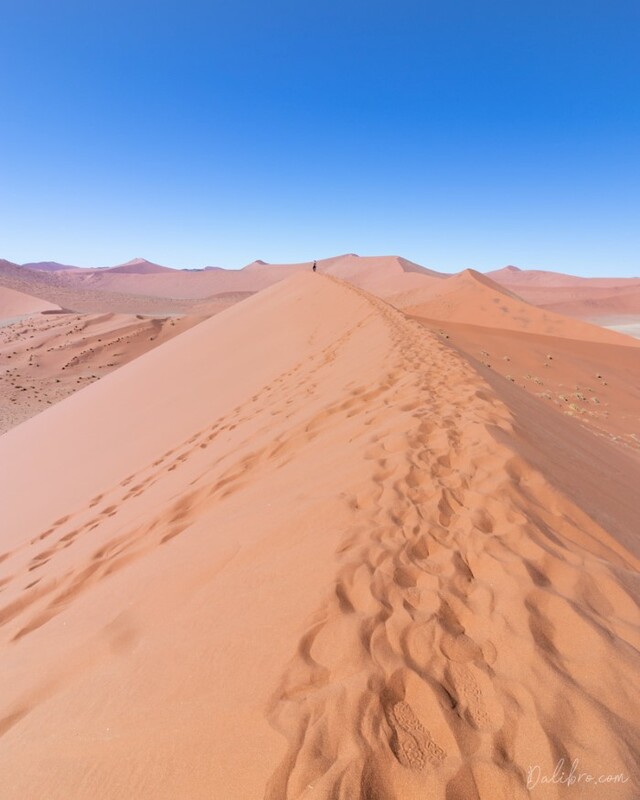 Sossusvlei is referred to when speaking of the entire clay-pan-system area which contains Deadvlei and also other tourist attractions like the Dune 45, Big Daddy Dune, Big Mamma Dune or Hidden Vlei. There is also a smaller but empty vlei, called Sossusvlei. So don’t get confused. Getting to the Sossusvlei area is pretty simple. First, you’ll need to get to Sesriem, which is kind of single point of entry. There is also a filling station and a couple of kiosks. 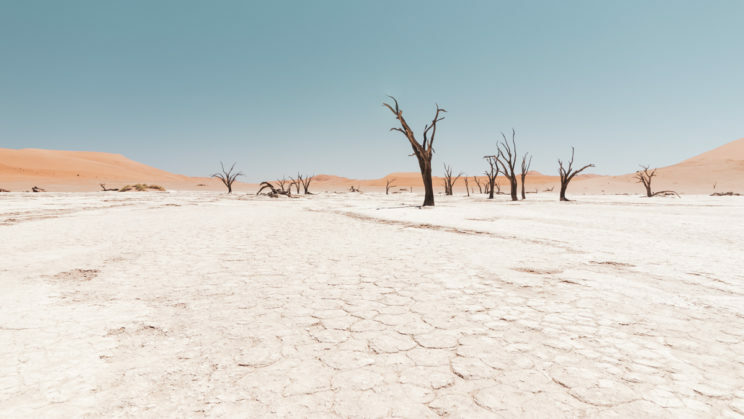 Since Deadvlei is inside a national park, you’ll have to drive through a gate in Sesriem, register your vehicle and pay the entrance fee at reception before proceeding. The fee is 80 NAD per person and 10 NAD per car per day (September 2018). The gate opens at sunrise and closes at sunset so you should plan your visit accordingly. Once you’re done at the reception, just drive down the road. There is only one so you really can’t get lost. The road (ca 60 km long) is tarred which feels like a real treat after spending so much time on rough gravel roads. 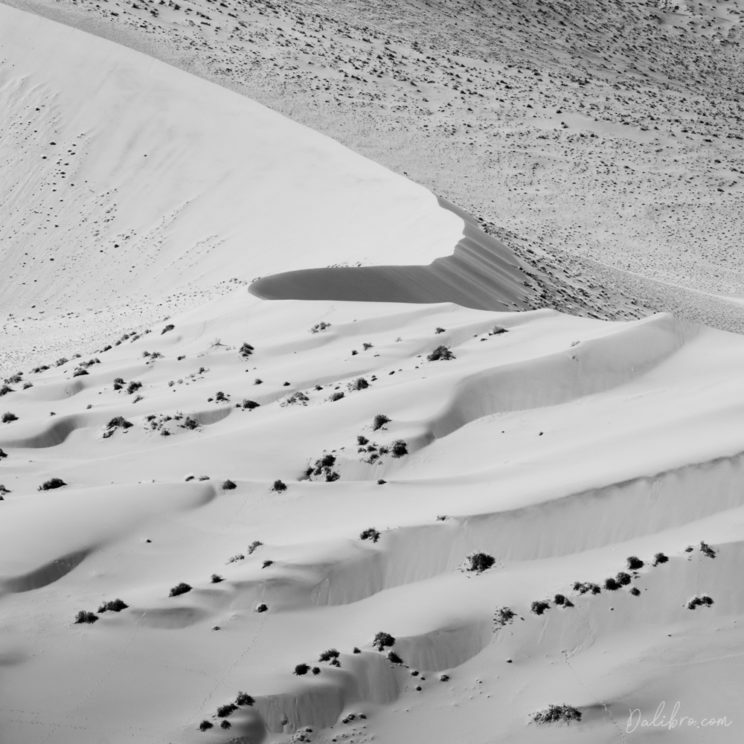 There is only a handful of stops on the way to Deadvlei, the most significant one is Dune 45. The number indicates the distance from the park entrance in kilometers. You can climb up the Dune and enjoy some truly great views of the area. Just bear in mind that it’s really high and that it takes time! Up on the Dune 45. ‘Big’. That’s the word you’re looking for. Dune 45 offers some amazing views of the area. Now, whereas the road is tarred for about 60 km, the very last 4 km section is not. In fact, you are not allowed to drive there unless you have a real 4×4 car (no SUV!). There is a parking area at the end of the tarred road. The last 4 km is quite an adventurous bit. Driving through sand is fun but you can easily get stuck. If you don’t feel confident about it, take a free shuttle. After that 4 km, you will arrive at the second parking area where the hiking trail to Deadvlei (but also Sossusvlei, Big Daddy, and Big Mamma) starts. 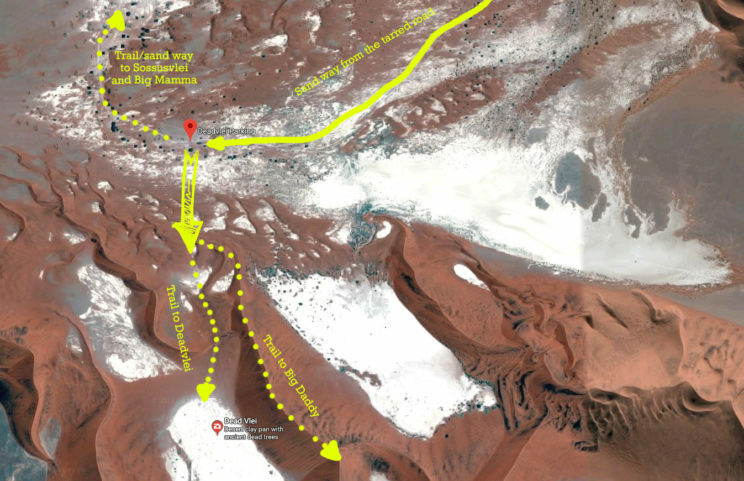 The trail to Deadvlei takes about 20-30 minutes of walking and is not marked. In general, you’ll find the vlei on your left side from the parking (looking in direction of travel). Check out Google’s satellite view to understand the site better. Or simply click on my map of the Deadvlei area below to download / print out. Map of the Deadvlei area shows you which directions you have to walk. Click to see the full size and download / print. The hike is not particularly difficult but do not underestimate it. You will need all sun protection you have and enough water (ca. 1 liter per person). It gets extremely hot during the day. There is a reason for the place to be called 'dead'. You should also know whether or not you'll go up the Big Daddy (which is the same direction) before you start the hike and equip yourself accordingly with more water. Timing is essential for visiting this amazing site. As mentioned above, if you’re arriving from outside of the park, you can get in after sunrise and leave before sunset. Pretty much all organized tours are designed to arrive at the gate at sunrise. And they all have exactly the same program, so it gets pretty crowded at each spot. We had this idea of arriving to the Sesriem gate about 1 hour after sunrise with the hope of avoiding crowds. This worked really well for us as the big tours were almost always about to leave when we arrive to a spot. I cannot guarantee that it would work every time but it might be worth considering since there is no chance of watching the sunrise in Deadvlei anyway. Unless you stay inside the park overnight. 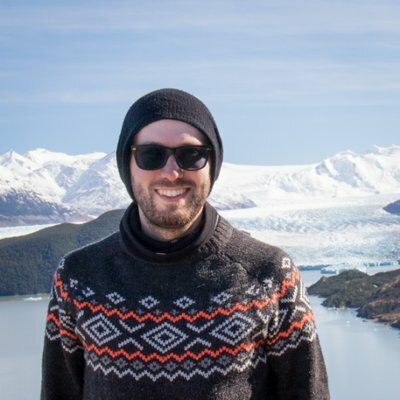 This is THE option for those of you, who want to explore the park during the sunrise. There is only one single lodge inside the gates of the national park – Sossus Dune Lodge. It is very expensive and gets sold out many months in advance (agencies often book a large chunk of the place at once). 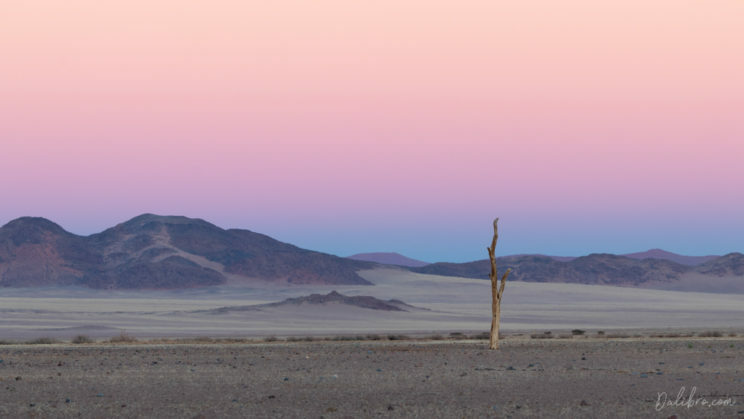 So if you really want to see the sunrise in Deadvlei (or on one of the big dunes), consider planning the Sossusvlei part of your trip as soon as you can. If you’re feeling adventurous, you might want to check out the NWR Sesriem Campsite which is behind the first gate and allows you to see the sunrise inside the park, too. Despite booking 9 months in advance, we were not lucky and there was no availability in the Sossus Dune Lodge for the night we needed. There are several lodges in the surrounding area but we struggled to find some capacity even there (again – we needed one particular night). Even if you’re not staying inside the park, book as soon as you can. We ended up in Le Mirage Desert Lodge & Spa which is basically a castle in a desert and absolutely amazing. Located about 30 minute drive from the Sesriem Gate. Its price tag is high but the experience is great! Plus the night sky we could watch directly from our little balcony. Very romantic and fairy taley! Probably the best night sky I’ve ever seen – Le Mirage Desert Lodge and Spa, Namibia. 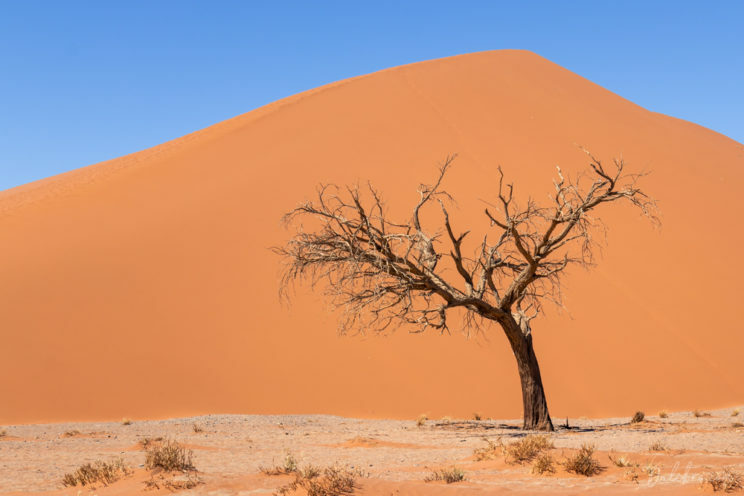 The area of Sossusvlei is simply overwhelming. If it’s your first time, you should be prepared for a compromise between photography and enjoying the site. Should you not stay inside the park, you will have to accept the fact, that there is no way of photographing during the sunrise or sunset. Once you’re over it, maybe draft a plan. 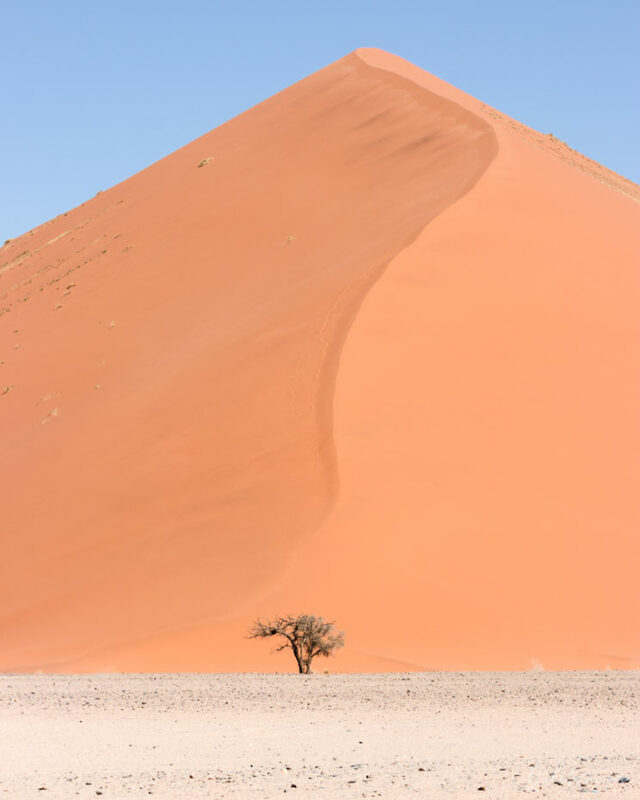 Do you want to climb the Dune 45 first and then visit Deadvlei? Or maybe the way around? Do you plan to go up the other two big dunes? 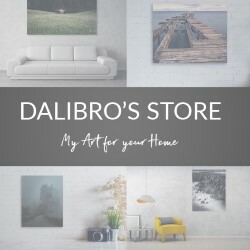 Do you want to stop and explore other areas as well? If you only have one day in the park, you’ll probably have to leave out something. Deadvlei is full of compositions. No easy job, though! Read more about this topic above in chapter Timing. We were not lucky enough to sleep inside the park. Sunrise is the favourite time for photographers in Deadvlei since shooting sunset would be logistically very difficult (before you pack, hike back and drive 60 km to the Lodge, it would get very dark). Staying overnight is, according to the leaflet we received, not allowed. What other photographers say is that the sunrise goes pretty fast. So if you don’t know the place, you might struggle with finding a good composition before the best light happens. In my case, we arrived literally in the middle of the day. On the plus side – no troubles with waiting for good light. It was flat and the air burning hot. Should you still do it? Oh yeah! 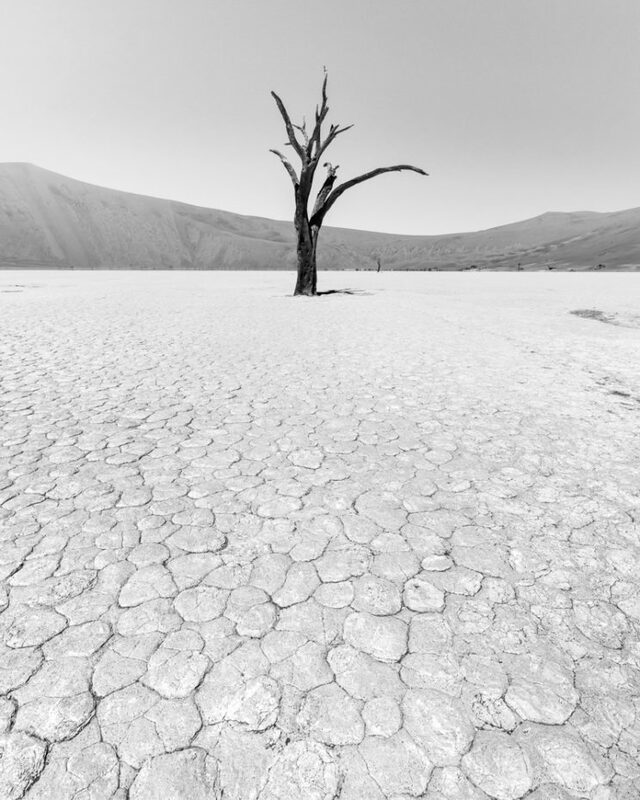 Patterns are something to look for in Deadvlei. Definitely a tripod to keep everything nice and sharp. You will be able to find compositions using all thinkable focal lengths, so bring whichever lenses you prefer. I shot only on lenses between 14 mm and 70 mm. But I wish I have used my long lens more – there are definitely some nice, less obvious compositions to be done with a long lens. And what’s more important – it enables you to get rid of the sky. The sky itself is fantastic but so incredibly blue that it’s almost disturbing. Oh, and the lens hood is a great idea too! Otherwise, you’ll have to shield your lens from the sun with your body, hat etc. 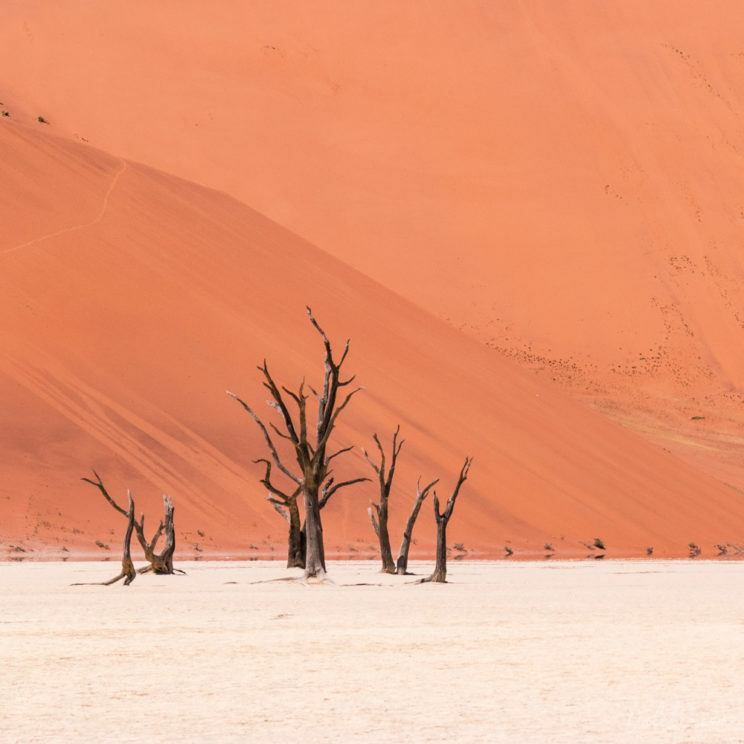 This image of the Deadvlei trees is in fact a crop of a wider shot. Bring a long lens! 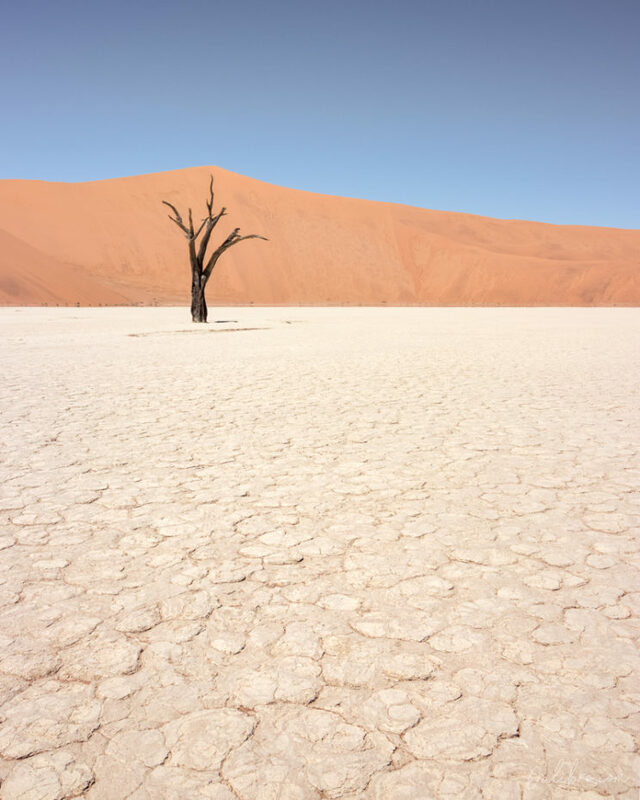 Namibia is an amazing destination and Deadvlei really is the cherry on the cake. Maybe one of the craziest places on this planet, photographer’s dream and a nightmare at the same time, Deadvlei and the entire Sossusvlei area has some unheard-of magic. If you do take amazing images or not, I am sure the visit will belong to the most unique and treasured moments of your life. 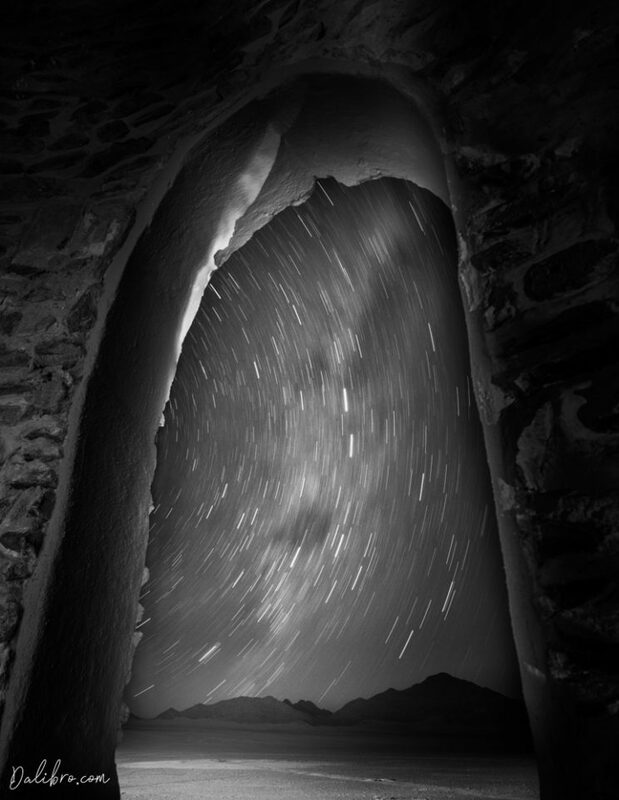 Amazing photography and wonderful writing! We were there just a few weeks ago and you captured it perfectly. We did stay in the amazing Sossus Dune Lodge for 2.5days so were the first ones on the big daddy dunes in the morning and the last ones in Dune 45 or one of the others in Namib deserts. Even just lounging in the lodge and looking out into the vast openness was amazing. I would totally recommend staying inside the national park. Definitely another addition to that never-ending bucket list!! Absolutely. My list just keeps on inspiring me, so I am always happy to add to it.